TWO DEADLINES ARE LOOMING: I'm working hard to keep moving out updates to the book and video, and our third child could be born at any time. Some days I feel overwhelmed with all that needs to be done with the book and preparing for the baby, and other days I feel energized. However I may feel, I just keep plugging away, making progress every day. This past week was a good one, as I've been able to ink illustrations, scan them in and build chapters 1 through 4. I'm just about halfway through the book, as chapters 5-7 have a larger page count, but feature worksheets and samples of sketchnoter work by a variety of people. I was fortunate to locate some bristol card stock at the art store that replicates the surface of the Moleskine sketchbooks I love. Having great paper and great pens makes all the difference. The final, inked art has been scanned at 600 dpi, which works well for quality and detail. I've been keeping the contrast on the art high, so the final pages will have a clear, crisp look and feel. Instagram has worked perfectly for sharing my work as I've progressed. 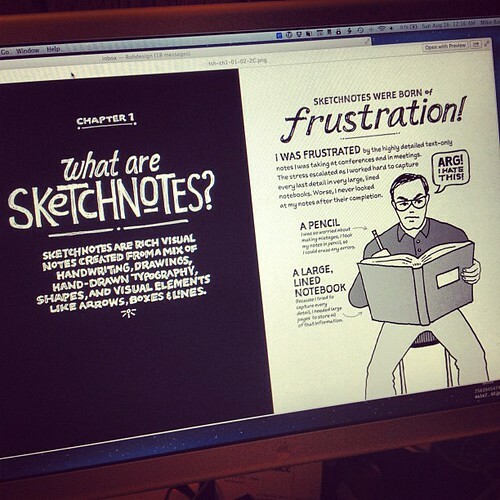 You can also see those images in my Sketchnote Handbook photo set on Flickr. I'm preparing to spend the rest of the week and weekend inking, scanning and building out the last 3 chapters (5, 6, 7) so that next week I can make any typo fixes and add orange highlights. The final artwork is being built in Photoshop, because of the flexibility it offers as I'm turning sketches into final art. 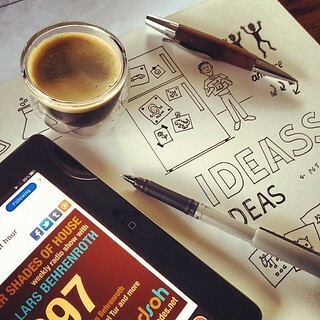 I can blend inked image scans with typography and tweak positioning in the app I'm most comfortable using. We're using PDF versions of the illustrations to trade commentary, which works well. I can open the PDF of sketches or final art on the MacBook's screen, and make changes in Photoshop on my main LCD screen. Once the final illustrations are proofed and prepared for 2 color orange and black, I'll import the high-res files into InDesign for page layout. I'll build the book from front to back, add page numbers and so on. Cover art for the book and video packaging will be created separately, as those need to get to the printer a little earlier than the remainder of the book artwork. I have much to do, but I'm feeling good about how the project is shaping up. Looking back, one of the best decisions I've made in the book project has been working with Delve Withrington to create fonts of my handwriting and headlines. 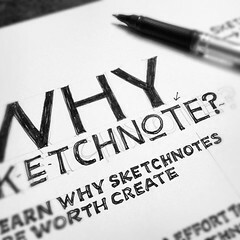 The combination of a handwriting font for body text and a hand-drawn, squared-style headline font has saved numerous hours of drawing and writing. 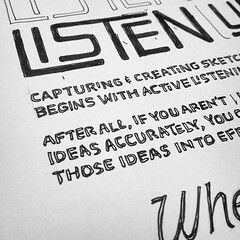 Ultimately, Delve and I will be offering a Sketchnote Family set of fonts for purchase, once the book and video are done. We're thinking end of 2012 or so, but we'll see. One thing at a time. 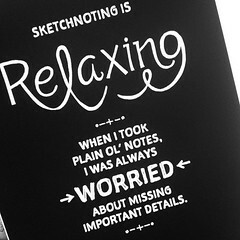 I'm very pleased with the variety of work I'm seeing as the featured sketchnoters deliver their sketchnotes to me. There are only 3 of the 14 left to go before I have all of the art — I can't wait for readers to see these beautiful pieces. The video is going well too. Brian Artka is busy editing the last of the 20 videos this week. When he's done, the huge video files go on a hard drive and will be shipped to Peachpit for production. I need to produce art for the packaging as well as the on-screen menu for the DVD. Should be fun learning about this stuff. Once again, thank you to everyone who has encouraged me. Writing, illustrating and designing a book is hard, hard work. Even harder when there's a video companion. Triple points for having a baby at the same time. However, I can already see how the book and video will help people give sketchnoting a try and may really change some lives. This is so interesting Mike, I just can't wait to get my hands on the book. Do you know if it will come out in the UK? Also do you have plans for iPad? I tried mine on it and the results were great (even with the illustrations etc). Finally, when do you expect to get it published? Thanks Max! I'm not sure about the UK - let me check with my editor on that. I believe we're doing a Peachpit PDF because this book is so graphical, though time will tell on what exactly will be done for the e-book version. I think there is a way to do a graphical Kindle book, but I'm new to this, so we'll just wait and see. Hey Mike kudos to you on the progress you've made with your handbook - I've been following on Instagram and can't wait to see the final product - it's going to be awesome! Are you planning a kindle/ibooks/pdf release?